There can be no quality control without making measurements, and the necessary instrument for such measurements in the graphics business is a spectrophotometer. There are many models on the market, and a handful of manufacturers to choose amongst, so in this article we will go through the characteristics you should look for when choosing the spectrophotometer that is best for your applications. A spectrophotometer can, as the name suggests, detect and measure the spectral composition of light, and translate the results into colour related data. There are several types of colour data, but over the years the encoding of colour data in the CIELab format is the most commonly known and used. The benefit of CIELab is that it is device independent, while encoding colour data as CMYK or RGB makes it very device dependent. In applied colour management we use ICC profiles to describe the characteristics of graphic arts devices, be it monitor, scanner or colour printer. You can calibrate monitors with a more simple (and cheaper) instrument called a colorimeter, but in order to calibrate and characterise colour printers you’ll need a good spectrophotometer. If you plan to do your own proofing before sending files off to be printed, you definitely need to keep reading. There are various of aspects to be aware of when you consider the type of spectrophotometer to buy. The main concern is probably to make sure the spectrophotometer is suitable for the type of substrate you want to measure. When using digital wide format devices you have the option to print on an extremely wide range of substrates, be it classic substrates like paper or vinyl, or transparent materials like glass or plexiglass (poly methyl methacrylate or acrylic glass), or wood, fabric and metal. One single spectrophotometer may not be able to measure all kinds of substrates. When measuring for example transparent substrates you will need a back lit function, and not many spectrophotometers support this. Another tricky substrate is metal, or substrates printed with metallic inks. In this case you might need a spectrophotometer using what is called sphere technology, where samples are measured from many viewing points. Caption: The Techkon SpectroDens is a handheld spectrophotometer which is able to do densitometric measurements as well as spectral readings. It also supports scan mode when reading for example rows of patches for quality control. Measuring printed textiles or carpets on the other hand has its own demands. Since these are materials with very uneven structures you either need a spectrophotometer with a very wide aperture, or to use a spectrophotometer which can operate in scan mode. While using a wide aperture gives you measurements over a larger area, and so gets averaged values that represent visual appearance well, with scanning mode you will get many samples over a certain area, and so get a good, representative measurements. Deciding which types of printed substrate you will measure will be the first dividing point to what type of spectrophotometer you need. For conventional substrates like paper and vinyl most of the spectrophotometers on the market will do. Among the better known manufacturers within the graphic arts sector are Barbieri, Konica Minolta Sensors, Techkon and X-Rite. Devices from these companies will then differ in price, depending on the speed and accuracy and special features they offer. For transparent substrates you will need a spectrophotometer with a backlit function, and such devices are not that common on the market. For tricky substrates like metal or prints with metallic inks you’ll need a spectrophotometer with sphere technology. Once you have narrowed done your choice of possible spectrophotometers to the types that support measuring the most common substrates in your workflow, you need to consider how many measurements you will make per day, week or month. The more measurements you will make, the more important the speed with which the spectrophotometer works. And there can be quite considerable differences between makes and models. When measuring reference test charts in order to build quality ICC profiles for a certain device, you might need to measure several test charts with up to 1500 patches or more. This is almost impossible to do using a handheld spectrophotometer which doesn’t support scanning mode. Caption: The Barbieri Spectro LFP qb can measure both reflective and transparent substrates and support scan mode. Quality on the other hand is somewhat more difficult to define for spectrophotometers, but one indicator here is the sampling interval and how much of the spectrum can be measured. The visible spectrum, the colours visible to the human eye, ranges from about 380 nanometers up to 740 nanometers. At and below 380 nanometers is the Ultraviolet part of the spectrum, and above 740 nanometers we are near infrared (IR), which borderlines heat. All spectrophotometers take samples at some interval, and you will need samples at least at every 10 nanometers to have quality data to work with. Caption: For more demanding substrates you might need a spectrophotometer using sphere technology, like for example this X-Rite Ci64L. But it doesn’t support scan mode, only spot measurements. Other quality aspects are the stated accuracy on the one hand, but also repeatability between measurements, as well as the expected repeatability between different spectrophotometers of the same model. 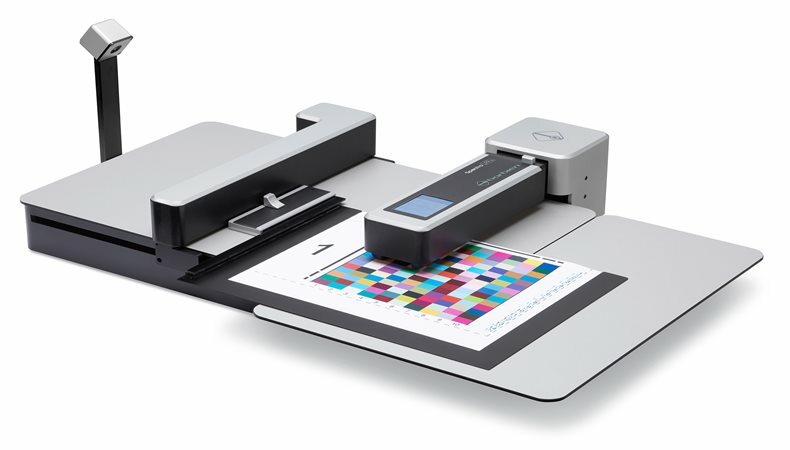 The latter is called interinstrument agreement, and is important when several spectrophotometers are used for quality control across the printer fleet, or between print service provider and print buyer. For serious quality control we need to be sure that our measurements are accurate and can be repeated by someone else using another model or type of spectrophotometer. Regarding price this as always depends on where you want to be. Buying cheap may prove to be expensive if the spectrophotometer you go for turns out to be too slow or not accurate enough. Remember that there is no such thing as expensive. What counts is whether a thing is truly worth the money, and if you will get a return on your investment. Once the core specifications have been defined for your coming spectrophotometer there are some additional functions and features you should consider before making your final decision. One thing is to try out if the control software is easy for you to use and this is somewhat personal. Does the software include an interactive manual? If it’s a handheld device with a built-in screen, is this screen easy to read with clear and readable icons and text? A handy feature is to be able to connect and transfer data wirelessly, so is this supported? A feature that has become more and more important in the last few years is the capacity of a spectrophotometer to measure a good portion of the spectrum in and near UV-light. This is because many types of papers today contain Optical Brightening Agents (OBAs), activated with the UV component of the light source. Many older spectrophotometers only have a Halogen lamp light source, which cannot detect the UV wavelengths in the reflected light from the printed substrate. In technical terms this is often referred to as the spectrophotometer being able to work in M1 mode, as defined in ISO 13655, the standard which specifies how spectrophotometers should operate. It’s impossible to create accurate ICC profiles for substrates containing high amounts of OBA, if your spectrophotometer doesn’t support the M1 measuring mode. Another thing to look for in the control software is a reliable colour library for well-known ink standards such as the Pantone spot colours. With regard to spot colours, it’s more and more common that reference values are specified in the Color eXchange Format (CxF), so the control software should be able to export and import CxF data. In technical terms you might want to use your spectrophotometer as a densitometer, which it should be capable of. But when measuring wet ink you probably want to use a polarisation filter. If so you should check if your spectrophotometer has, or can be coupled with, a polarisation filter, or you might not get reliable densitometric measurements. Learning how to properly use a spectrophotometer is key to applied colour management, and the route to efficient quality control of printed matter. Choose your spectrophotometer well, and it will serve you well for many years ahead. The Wild Format guides are intended to expand awareness and understanding of the craziness that can be created on wide format digital printing devices, from floors to lampshades and everything in between.These guides are made possible by a group of manufacturers working together with Digital Dots. This article is supported by HP (www.hp.com), Techkon and Digital Dots. FESPA’s new colour management feature, COLOUR L*A*B* will be introduced for the first time at Global Print Expo 2019 in Munich. It is aimed at helping visitors improve colour management practices in their own print businesses. The feature provides a walk-through showcase of representative technologies from a range of specialist suppliers, live demonstrations, guided tours of the exhibit, and educational presentations from subject matter experts.